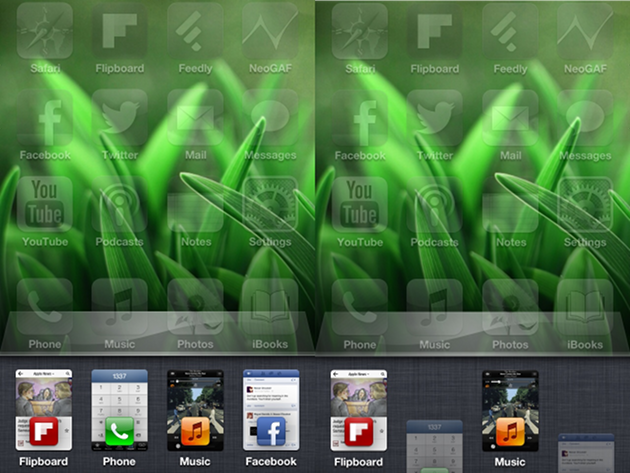 Back in October, we saw a concept for an improved app switcher that would take advantage of the iPhone 5’s taller screen. The additional space could allow for more than just icons, it could be used to include preview screenshots, an expanded media player, and toggles for wireless radios. The Tweak: The concept is now a reality on the iPhone and iPod Touch. Auxo includes all the features from the mockups and expands on their basic function. Want to remove apps from the switcher? Just flick them below the screen. Want to clear them all? Tap and hold on an app until a prompt shows up. What’s really impressive is Auxo will alert you if you attempt to kill the music app you’re listening to, Auxo will display an alert. I can’t count the times I’ve accidentally quit from my music player, so this is a welcome feature. What was once a concept for the iPhone 5, now running on the iPhone 4. All the pages have these additional features: For the music player, there’s a volume slider hidden below the track information and if you can tap on the album art icon to expand it to full size. If you need to change your WiFi configuration, hold onto the WiFi icon in the toggle page and Auxo will link you to page in Settings. If you slide down, there are rows of other toggles and shortcuts. The additional features are well hidden, but still intuitive. We’ve seen similar tweaks manage multitasking, toggles, and music playback, but this is the most polished interface we’ve seen to combine all three. We wouldn’t be surprised to see something very much like this in iOS 7. Caveats: Auxo will only run on the iPhone 4 and the 4th generation iPod Touch in iOS 6, which is a shame because the original concept was designed to take advantage of the iPhone 5’s larger screen–though we can’t fault Auxo for this. According to Auxo’s Cydia page, the tweak will include support iOS 5 sometime text week–meaning it will support more devices without relying on an untethered jailbreak. The iPad version will be available in early 2013, and we’re curious to see what Auxo’s developers will change for the larger screen. 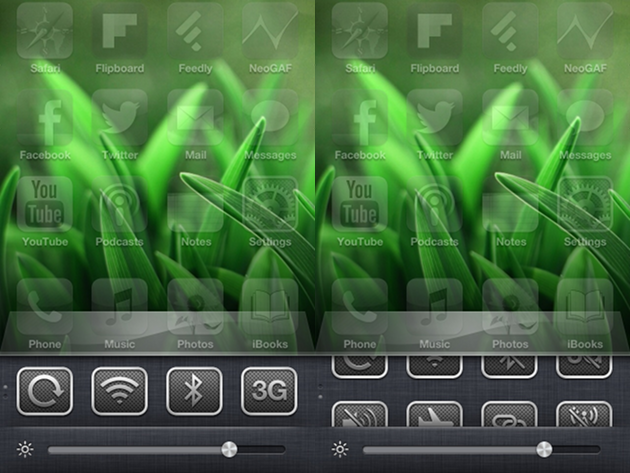 Auxo includes toggles for screen rotation, WiFi Bluetooth, 3G, mute, airplane mode, tethering, and cellular data. Where to find: Auxo is available in the BigBoss repository on Cydia. At $1.99, it is a paid tweak, but given its polish and feature set, it’s well worth the price. Auxo can be configured in the Settings page. Alternatives: While Auxo is an incredible tweak, we’ve seen some of its features in the past. SBSettings is a free, and highly customizable tweak that includes support for third party toggles and dozens of handy utilities. 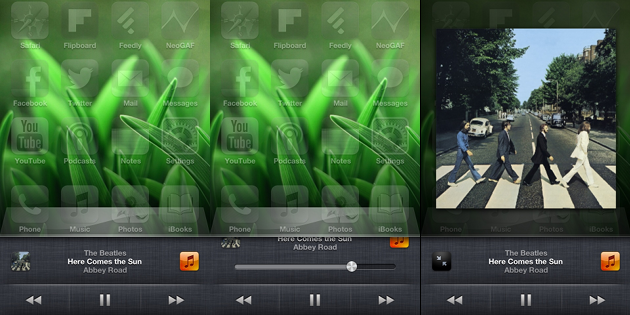 Music Controls Pro includes an enhanced music player that appears opposite the app switcher, at the top of the screen. While there are other features, it’s fairly expensive at $5.99. CardSwitcher is a $1.99 tweak that replaces the standard app switcher with webOS-style cards. Are you switching to Auxo? Share your thoughts in the comments section below. I was thinking about switching to Auxo, but I want to wait until other shared their thoughts about it. Just one little think: the article says “sometime text week” should be next week should it… Not complaining, just found the little mistake while I was reading the article. When it will be available for ios 5.1.1…. Auxo is an incredible tweak. The funcitonality is supperior and better implmented than many other tweaks that have attempted too. This is a simple and beautiful tweak, I would definitely say this is very well worth the price for paying.